Buffer concentrates (Sorrensen). Each concentrate makes 5 litres of ready-to-use buffer at specified pH +/- 0.1 ph Units when diluted with deionised/distilled water. 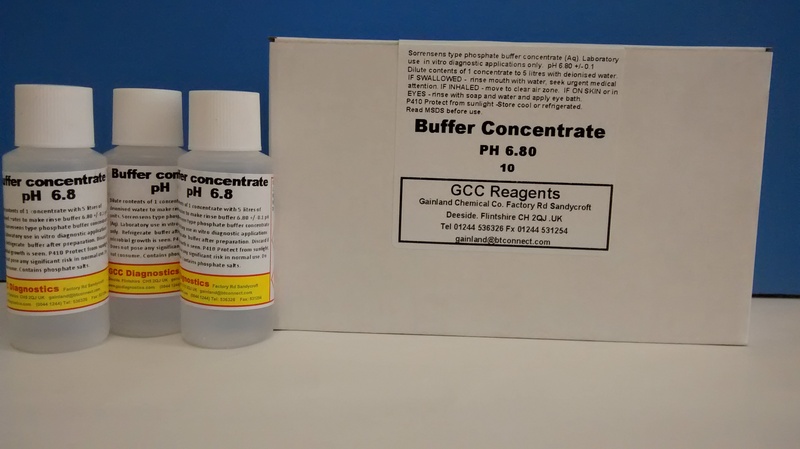 Buffer concentrates (Sorrensen) Each concentrate make 25 litres of ready-to-use buffer at specified pH +/- 0.1 ph Units when diluted with deionised/distilled water. Each tablet makes 1 litre of buffer/ stain diluent. Saline Concentrates 20 X Concentrate. Each concentrate produces 0.85-0.9% buffered Saline at the specified pH +/- 0.1 pH units when diluted with deionised/ distilled water. 500ml concentrate makes 10lts. 1ltr concentrate makes 20lts.